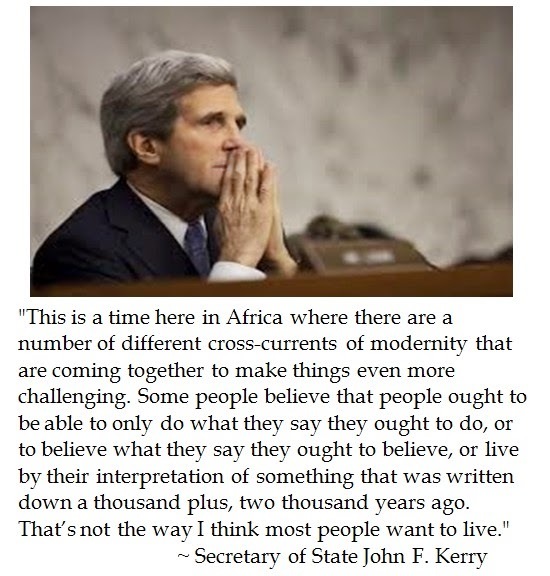 While speaking at the US Embassy in Addis Ababa, Ethiopia, Secretary of State John F. Kerry remarked about the "cross-currents of modernity" in Africa. Kerry made these "cross-current" comments in tandem with remarks calling for respecting the rights and liberties of individuals. It could be a veiled reference to the persecution of Ethiopian Christians as the Islamist group Kewarjah, repeatedly attacks Christians in Southwest Ethiopia. Moreover, the government has sought to ban all religious messages and talks in public. However, the Secretary of State's summary of his talks neither seem to approve of religious pluralism or respecting religious observance. This hardly reflect President Obama's recent robust public comments endorsing religious freedom. Kerry's even-handed approach to addressing religious liberty in Ethiopia dismisses religious creed as being relevant in the "cross-currents of modernity" and declines to address what religious fanatics are enforcing their interpretations of faith.